After rumors coming through left and right, Google finally took the wraps off of the first smartwatches to don Android Wear 2.0. The LG Watch Style and LG Watch Sport have been unveiled and bring a classic look to your wrist, while offering the latest that Android Wear has to offer. The LG Watch Sport is the bigger and more powerful of the two devices and really showcases all of the features and capabilities that can be packed into a smartwatch. The LG Watch Sport comes with a 1.38-inch P-OLED display with an ambient light sensor, but no “flat tire,” a 430 mAh battery, and a host of electronic gadgetry including support for LTE, GPS, NFC and a heart-rate monitor. Due to all of the antennas and such, portions of the watch’s workings are located in the bands, meaning they are not swappable. Besides the inclusion of various sensors and chips, LG also added a couple buttons to the LG Watch Sport. One is for triggering Android Pay and the other button is dedicated to launching Google Fit for activity tracking. LG also upgraded the “crown” button so that it rotates providing an additional means of input for controlling the smartwatch. The second device is the LG Watch Style, which is a much slimmer device. 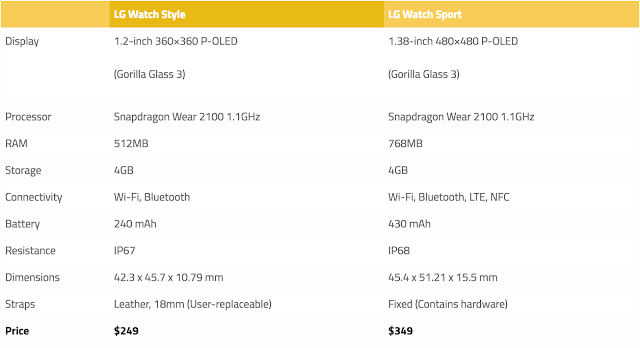 Cutting down on the size also means this device does not get many of the features compared to the LG Watch Sport. The LG Watch Style gets a 1.2-inch display and a 240 mAh battery. 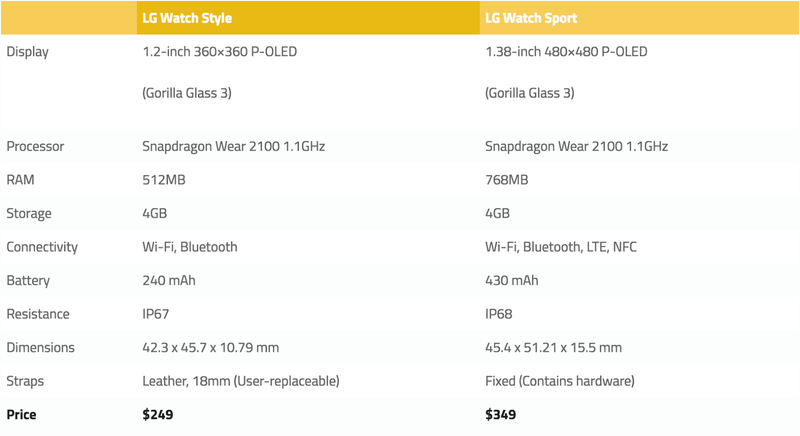 That battery is not driving nearly as much hardware though as the LG Watch Style does not get LTE, GPS, or NFC chips nor does it get the heart-rate monitor. This svelteness does mean the LG Watch Style gets a standard leather band and bands can be swapped out with any standard 18mm watch band. The LG Watch Style does get the same rotating “crown” button as the LG Watch Sport.